I started diving because I had a fear of the ocean due to nearly drowning as a little girl and I wanted to overcome that fear. Well, it worked! I now have over 550 dives and absolutely love teaching new divers. I have even been known to hold people's hands on their first dives in the ocean. It's an amazing experience to see them transform from saying I'm scared and don't think I can do this to " I am so glad I did this , I love it". I've met some awesome people and made many friends through diving. 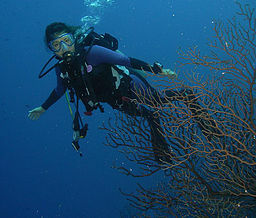 I have lots of dive buddies that I enjoy traveling with to new dive destinations all over the world. Come join us for an adventure of a life time. The underwater world is like nothing else - it is amazing. I have traveled extensively and met wonderful people that all share a passion for travel and diving.